Jedward talks about Big Bang, 2NE1, IU and the KPop fans on SBS Pop Asia Interview! Jedward were interviewed in SBS Pop Asia, and they couldn't be stopped sharing their experiences with Big Bang, 2NE1, IU and the KPop fans! Jedward admitted that they didn't know anything about K-Pop at first until they saw the billboards of Big Bang and 2NE1 in Tokyo and had the chance to rub shoulders with them. John (in red) revealed that Taeyang was the first Big Bang member they were able to talk to, and they were quite surprised that he could speak a perfect English. They also shared that the whole staff during the Big Bang concert in Tokyo thought they were also crazy fans and didn't realize that they were artists too. And the real fans were surprised of their hair because during that time Taeyang had a spunky hair and they had a spiky hair. The host was shocked to know that Jedward was actually part of Big Bang's 'Bad Boy' MV, they were proud to say that they were the ones who cut out the 'broadway' sign. On 2NE1, Jedward told that they also met 2NE1 in Tokyo in a commercial for Addidas, while they met IU on backstage on her concert. The duo also complimented the K-Pop fans, John said, "K-Pop fans are like insane. The fans are the best. I can't believe how amazing all the fans." 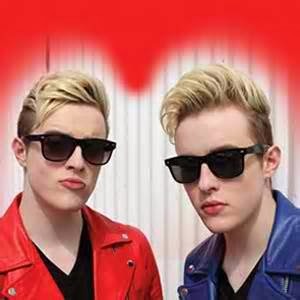 John and Edward Grimes or Jedward are an Irish identical twin singing duo who are discovered in the sixth series of The X Factor in 2009 where they finished sixth. SBS PopAsia is an Australian music television series which features songs from Korea, Japan, China, and Indonesia. It is hosted by Jamaica dela Cruz and PopAgent Jay K, and it airs on the channel SBS2 every Saturday and Sunday evenings.